I can't believe it's almost that time of year again! 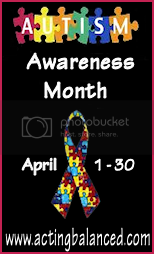 I am gearing up for another fun and exciting Autism Awareness Month event and want to make sure that you, my readers, know that I'm accepting guest posts about ASD, Sensory Integration and any other related topics! I know that last year, some of the best responses were to posts that were personal and gave my readers a glimpse into the real world of Autism, Aspergers and PDD NOS. Whether you are a blogger or not, a parent, friend or teacher, or you have ASD yourself, I would love to hear from you if you are interested in guest posting during April! I am also open to receiving proposals for sponsored posts, reviews, giveaways and events that you want to publicize - just shoot me an email at heather@actingbalanced.com and let me know what you are offering. For my fellow bloggers, I also have permission to share many of my Autism related contacts for books and products to review, guest posters and interview subjects - if you are interested in these contacts I'm happy to share!